Emergency Auto Repair & Service - Bobby Lloyd's Lakeview Automotive - ASE Certified Mechanic in Deep Creek Lake, Maryland, Garrett County - Dependable, Honest, and Simply the Best. Dependable, Honest, & Simply the Best! or repairs, please call to make an appointment. Authorized distributor & installer for Gorilla Offroad Company. I've worked in my own garage, in a local service shop, and even as a decorated Service Manage at a local automobile dealership. I've seen quite a bit but one things always holds true, all my customers are treated with the utmost respect and care. If your needs are for a routine oil change or a major engine rebuild, Lakeview Automotive can handle it. I am trained and certified in a wide variety of automotive technologies and I use top of the line tools and diagnostic equipment. Over the past 20+ the years I have more than 250 classroom courses under my belt and countless hours under the hood. I pledge to provide honest, reliable and dependable automotive services, with a goal of total customer satisfaction. I am the ONLY mid-Atlantic authorized distribtuor and installer of Gorilla Offroad Company products. 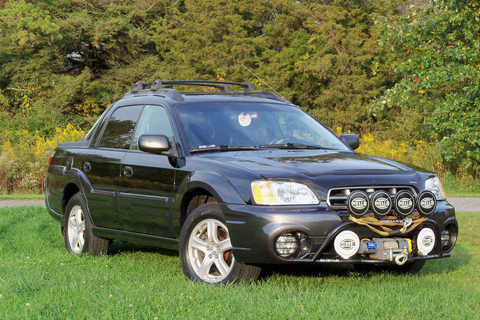 On these country roads and during these harsh winters a minimal investment of just $100 will have your Impreza, Outback, Forester, Legacy, or XV protected from the elements and damaging salt used on Western Maryland roadways when I install Gorilla Offroad Company Mud Flaps / Gravel Guards on your Subaru. For more protection, consider their Offroad Bar - with thick 1.25 inch chro-moly tubing up front and underneath with an optional 1/8 6061 aluminum skid plate protecting the under carriage you can take your Subaru places it has been asking you to go ... with confidence. As the ONLY authorized shop to install these products in more than a 500 mile radius, you know you'll get the best installation and the highest level of customer service from Lakeview Automotive. Pictured left is a 2007 Subaru Impreza WRX equipped with the Gorilla Offroad Company Offroad Bar (with skid plate) and Mud Flaps / Gravel Guards. As you can see, the owner is putting them to good us in this rallycross event - a great testament to functionality and durabilty you can expect from these products and is exactly why I recommend and stand behind their work (as they do to mine). Check out their complete line up at gorillaoffroadcompany.com and mention Lakeview Automotive when placing your order and we'll work together to hook you up. More product pictures and information can be found on their Facebook page as well. Remember, I'll do a complete install of their products as well as any other preventive maintenance, brake repair & service, transmission repair & service, oil change & lube service, or any work you need done to your Subaru. Emergency Repair is also available - just give me a call at 301-387-6245 if you're in a jam!